My friend Beth shared this recipe with me. 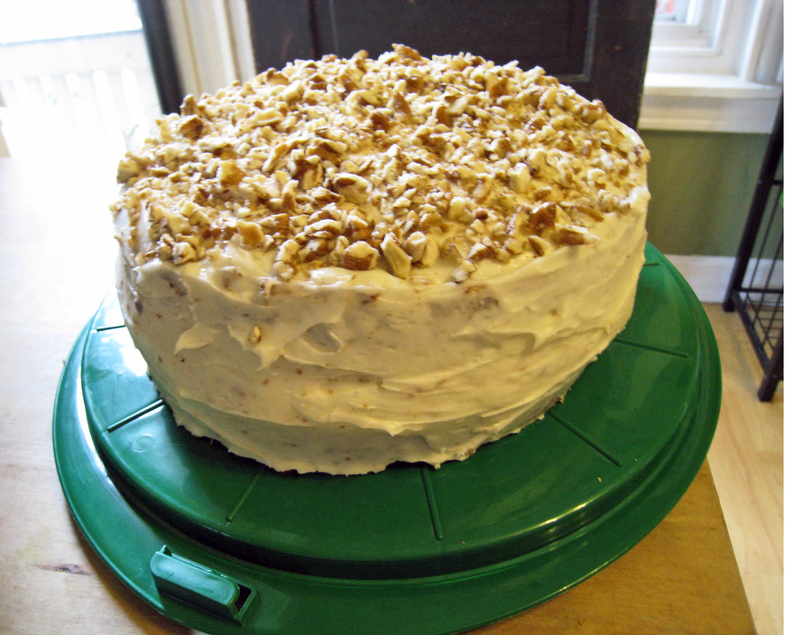 I had never heard of hummingbird cake before but when Beth explained it to me, I thought it sounded perfect to make for Easter dinner. It was delicious! I guess it’s a traditional Southern cake, but now it’s going to be making its way into our house more often. 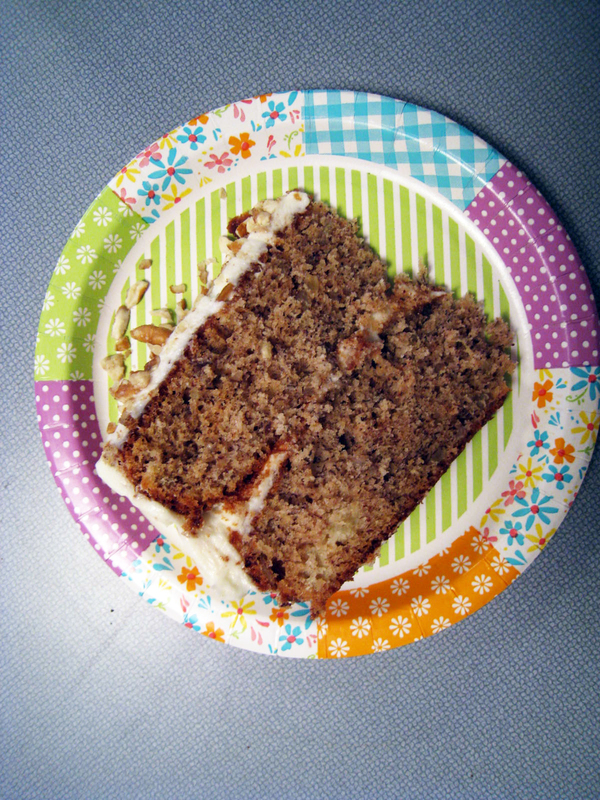 It has the same texture as carrot cake but brings together banana, pineapple and pecans. I was also able to use fresh Georgia pecans from my friend Megan that I won in our mom’s board auction. The recipe is for a three layered cake but I made with only two layers and it worked out fine. I really do need to invest in that third cake pan! Preheat the oven to 325. Put the sugar, eggs, oil, banana and cinnamon in a freestanding electric mixer with paddle attachment and beat until all the ingredients are well incorporated (don’t worry if the mixture looks slightly split). Slowly add the flour, baking soda, salt and vanilla and continue to beat until everything is well mixed. Stir in the chopped pineapple and pecans by hand until evenly dispersed. Pour the batter in the prepared cake pans and smooth. Bake in the preheated oven for 20-25 minutes, or until golden brown and the cake bounces back when touched. Let the cake layers cool slightly in the pans before turning to wire racks to cool completely. When the cake layers are cold, put one on a cake stand and spread about 1/4 of the Cream Cheese Frosting over it. Place a second layer on top and spread another 1/4 of frosting. Top with the last layer and spread the remaining frosting over the top and sides. Finish with pecans and a light dusting of cinnamon. Beat the confectioners’ sugar and butter together in a freestanding mixer with paddle attachment on med-slow speed until the mixture comes together and is well mixed. Add the cream cheese in one go and beat until it is completely incorporated. Turn the mixer up to med-high speed. Continue beating until the frosting is light and fluffy, at least 5 minutes. Do not overbeat, as it can quickly become runny.